With the delightful Spring weather we've been having in Texas, the hubs and I have been tackling a few outdoor projects. One of the next items on our to-do list is new front porch furniture. 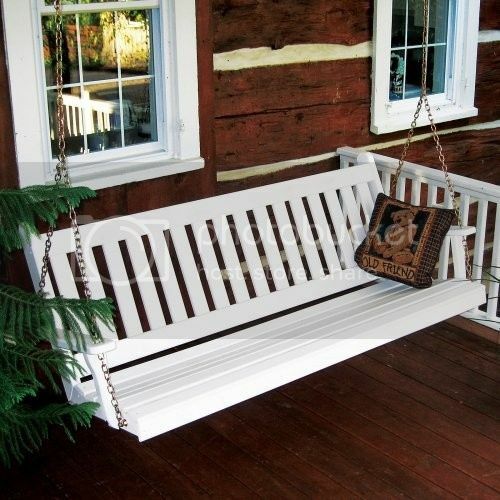 I'd really love a pretty porch swing...and, I'd love it even more if we could DIY-it. Not sure a complete bulld is in the books, but maybe we can buy something unfinished and stain it?! Or, restore an old beauty? So many routes we could take! Isn't starting the hardest part of ANY project?! It is for me, at least. That's why I love the Staining Made Simple guide! It's helps take some of the guesswork out of staining projects. Using their simple guide, you can get all the information you need to start (and finish!) your staining project. Love that! Wouldn't this swing be pretty in a dark stain? The great thing about Flood® Wood Care is that the products are so easy to use and the Staining Made Simple guide makes it totally easy to get started. After I found my perfect unfinished front porch swing, I used the Staining Made Simple guide to determine exactly what products (and how much!) I'd need to easily finish it with Flood® Wood Care. By answering a series of simple questions, I was given the two products I needed for my project. It even told me where to purchase the Flood® Wood Care! Perfectly easy. Right now you can enter to win a $1,500 gift card for your own staining and backyard projects! Plus, you could win a $10 gift card instantly. Flood® Wood Care is giving away 12 $10 gift cards every, single day!! It's all part of the Flood Better Backyard Sweepstakes. The sweepstakes ends May 17, 2013, so you'd better hurry! *NO PURCHASE NECESSARY. Legal residents of the 50 United States (D.C.) 18 years and older. Ends 5/17/2013. To enter and for Official Rules, including odds, and prize descriptions, visit their Facebook page. Void where prohibited. This Sweepstakes is in no way sponsored, endorsed or administered by, or associated with Facebook. You understand that you are providing your information to Sponsor and not to Facebook. You can even put a dress code of colours related to love like red. day cards and keep giving them till somebody says yes. We believe its shocking for many, but we have discounts and offers for the latest Kinect as well.